Is Everfun Art product hand painted or printed? Everfun Art is one of the largest online suppliers of hand painted oil painting on canvas wall art. We provide hand painted modern decoration oil painting, modern painting, abstract painting, flower painting, landscape painting, buddha painting, seascape painting, beach painting, portrait painting etc. Hand Painted oil on canvas by our professional artists. 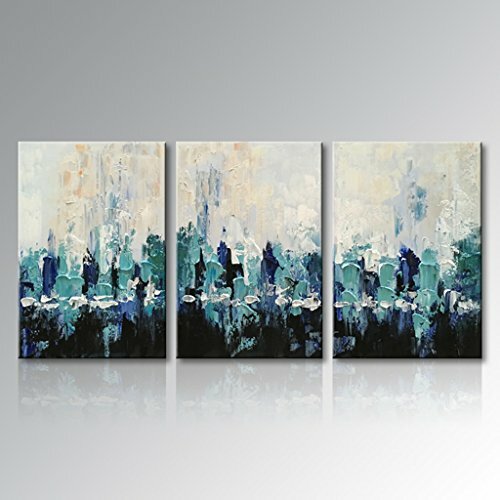 This is hand painted abstract oil painting on canvas, it is not a canvas print. This canvas wall art are suitable for living room, bedroom, kitchen, office, Hotel, dining room, bathroom, bar etc. Gallery Wrapped and Stretched on strong wooden stretch frame, FRAMED - Ready to hang for home decorations wall decor, edges are painted,each panel has a black hook already mounted on the wooden bar for easy hanging.